Posted by themidlifesecondwife in Love, Relationships and Family Life, Special Events, What's the Buzz? 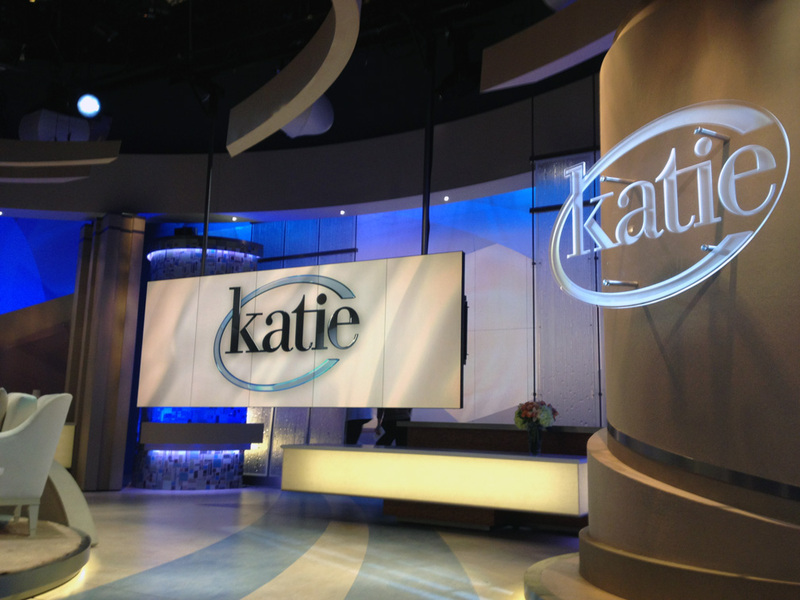 The elegant set of ‘Katie.’ The show is taped at ABC Studios in New York and syndicated across the United States. (MONDAY, OCT. 22, 2012)—UPDATE: I learned late last night that the segment featuring Dr. Terri Orbuch has been postponed and will be rescheduled. When the producers announce a new air date I will let you know. Hope you can tune in to watch Academy Award-winning actress Susan Sarandon speak with Katie Couric and see both women engage in a bit of competitive sport! The call came on a Monday in August, about a week after I had returned home to Richmond following the BlogHer conference in New York City. On the line was Brittany Jones-Cooper, a producer of Katie, Katie Couric’s new syndicated daytime talk show. She and Couric had been at the BlogHer conference—Couric was featured in one of several keynote interviews, engaging in a lively discussion with BlogHer cofounder Lisa Stone, and issuing a clarion call for bloggers to participate in her new show. The television legend certainly came to the right place! And, it would seem, so did I. Back to that phone call. Couric’s producer had seen my blog, liked what I wrote, and asked if I could be in ABC Studios in New York on Thursday for a taping. 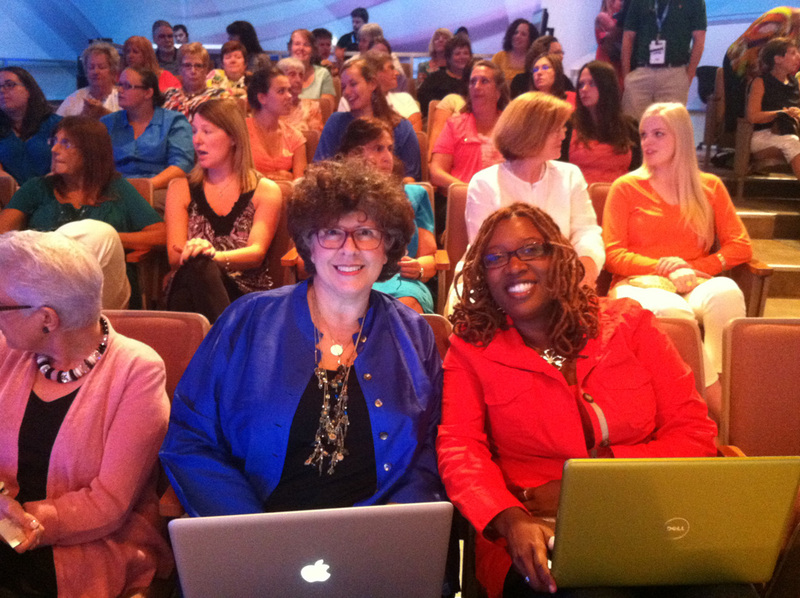 Couric has employed several ingenious methods of integrating social media into her program; one way is to have two bloggers in the audience for each show. The theme of this particular program would be divorce. Now as we all know, I happen to know a little bit about that subject. And so it was that three days later, my husband John, who grew up about 20 minutes outside of the city, drove me into Manhattan. A bonus of the trip? We’d take some time to explore all of the landmarks of his youth—something I’d wanted to do ever since meeting him. What a whirlwind! Just arrived backstage at the ABC Studios, still wearing my traveling clothes. TMSW got dressed and made up in record time! You’re reading about all of this now because the program I was invited to attend airs on Monday, Oct. 22, at 3 p.m. on NBC12 in the Richmond market. 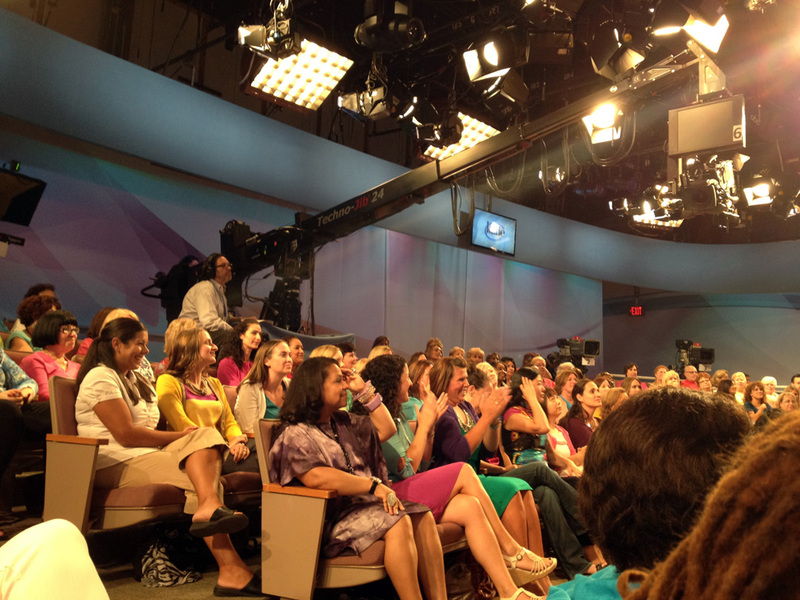 You’ll want to visit the Katie website to check your local listings; in some markets the program airs at 2 p.m.
Katie Couric chats with the audience before the taping. Check out her gorgeous shoes! The featured guest? One of my favorite actresses—the smart, sultry, simply ageless Susan Sarandon—as admired for her social activism as she is for her award-winning performances. Single after a long-term partnership with actor Tim Robbins, she turned 66 earlier this month; she shares her thoughts about commitment, relationships, and what it’s like to be an older—albeit steadily working—actress in Hollwood. 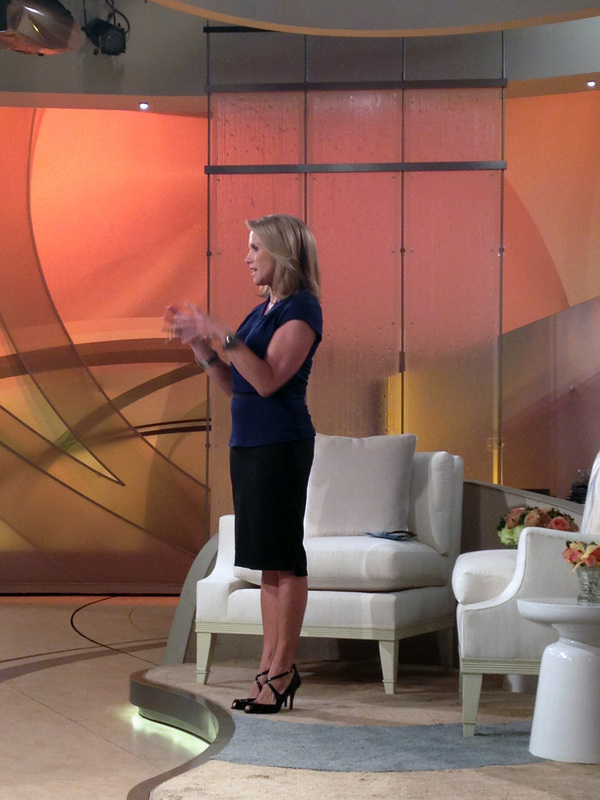 Also on the show is Dr. Terri Orbuch, aka ‘the love doctor,’ offering useful marital advice—from a surprising source. After the taping, Sarandon and her two dogs, Rigby and Penny, posed for pictures with Katie. Remind me to tell you a cute story about Rigby! The producer also asked me to write an essay for the program’s website about finding love after divorce. (I happen to know a little something about that, too.) 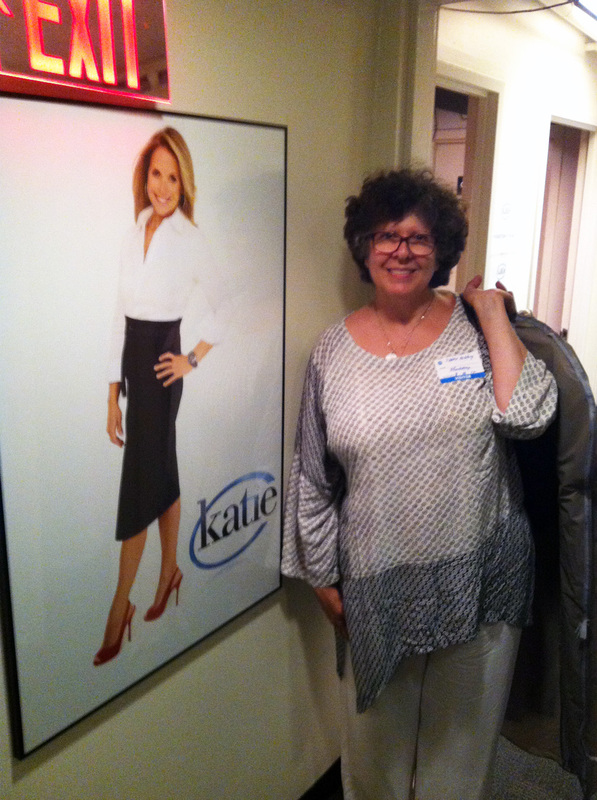 KatieCouric.com published “Learning to Love Again” on Oct. 22, 2012. The post appears as “The ‘L’ Word” on this blog. I hope you’ll have a chance to tune in or follow my LIVE tweets during the broadcast. Enjoy! And as always, thanks for reading! Wow, Marci! Congrats! I am going to be taping that episode for sure. Are you ready for the big time? I know you are! Ha ha! Thanks, Debby. I have no idea if I’ll even show up on the screen. They had a gazillion cameras running though, so who knows. I’ll be in the front row, should be off to the left of the screen. Thanks for taping! This is terrific, Marci!! Congratulations! This is so exciting — congrats, and give a Twitter shout-out on the 22nd to remind us! Thanks Lori! I promise—I will! FAR OUT! This is just wonderful! Marci, so excited for you! Thanks, G&F! I’ll tell you, August was a whirlwind of a month! I bet, please share your stories with GenFab we are all excited for you and want to hear more. I’ll be glad to…sometime after Nov. 6, though. On top of everything else, I’m on deadline to interview Sally Field & write up an article for the Richmond Times-Dispatch. You look great! What breed are Susan Sarandon’s dogs. Arrrgghhhh…you would ask me that. I didn’t have that down in my notes. If I were to guess, I’d say Bichon Frise? This is so incredibly exciting! Especially for those of us in the “older blogger” set. You’re sweet, Pauline. Thank you! Yeah, we older bloggers get around. The kids have got nothing on us! Congratulations! Such an exciting opportunity for you! Thank you so much! Hope you’ll have a chance to tune in or follow the LIVE tweets! So, have they offered you a permanent spot on that show yet? How do we call up and demand that? The online producer could not have been lovelier. She was actually at the midlife bloggers’ session at BlogHer. From start to finish, they were terrific. I’d love to return if asked. Your journey just exploded! Congratulations!! Dianne! Wonderful to hear from you. Thanks so much! So proud of you, my friend. Michelle….thank you so much. I’ll tell you, this has all been quite the ride! And you were here from the beginning! Congratulations! Such an inspiration you are, Marci! Enjoy! You are such an inspiration! Congratulations! Enjoy every minute of the ride. I’ll be watching! Thank you! No telling if you’ll spot me in the audience, but I will be tweeting LIVE and you can follow along via my handle: @midlife2wife. Congratulations, Marci! That is so exciting! I’ll have to tell my friends to be sure to watch Katie that day and I’ll tell them all that I know that famous blogger lady in the front row! Nina, you’re so sweet. Thanks so much for stopping by, and for your lovely note! Wow! How cool is that!? Pretty cool. Thanks so much for stopping by & taking a moment to share! A big congratulations! I am so happy for you, this is so exciting. I wish for you even more wonderful successes! Thanks, Michelle!! Wonderful to hear from you–thanks for reading! Saw you through Karen and Wendy at “After The Kids Leave”. So exciting. Bloggers taking over the world! I’m so impressed Ms. Couric is incorporating bloggers into what she’s doing. Way to go, Katie! And way to go, Marci! You make me proud to be one of your tribe! Thanks, Susan! I’m honored by your note. Yes, the social media integration is an incredibly smart thing for Katie to do, but then she’s a pretty smart lady! Congrats on your accomplishment! And your new happy found love! We’ve chatted before. I have a similar story with my sweetheart of a husband!